-- Select a Size -- Small/Medium - Out of Stock! Medium/Large - Out of Stock! 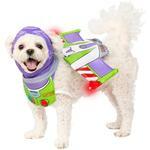 Your dog is sure to impress on Howl-o-ween with the Toy Story Buzz Lightyear Dog Costume Accessories by Rubies! Your pup is sure to get all of the loot while looking super cute in this adorable Toy Story Buzz Lightyear Dog Costume Accessories by Rubies. This adorable costume accessories set features a light-up jetpack making your pup look just like Buzz Lightyear from Toy Story. The separate headpiece completes the look. This dog costume is sure to have your dog standing out at pet parades and Halloween costume contests. Also great for photo opportunities. Not all costumes will fit all breeds and breed suggestions are not costume specific. Consult Rubie's Pet Size Chart as a guide. Please note: different breeds have different proportions. Rubie's Pet Shop Boutique suggests going up a size if you are unsure of what size to get.